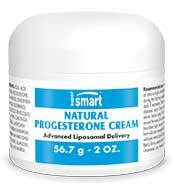 Progesterone is a steroid hormone secreted mainly by women, and to a lesser degree, men. Like oestrogen, progesterone is involved in the female menstrual cycle and in pregnancy. Progesterone levels rise to prepare for and maintain a pregnancy and then decline if pregnancy does not occur. They also fall during the menopause. A lack of progesterone manifests principally as PMS symptoms and hot flushes. Some plants have shown benefits in reducing these effects. One such plant is yam from which a natural progesterone has been developed and is today available as a dietary supplement.